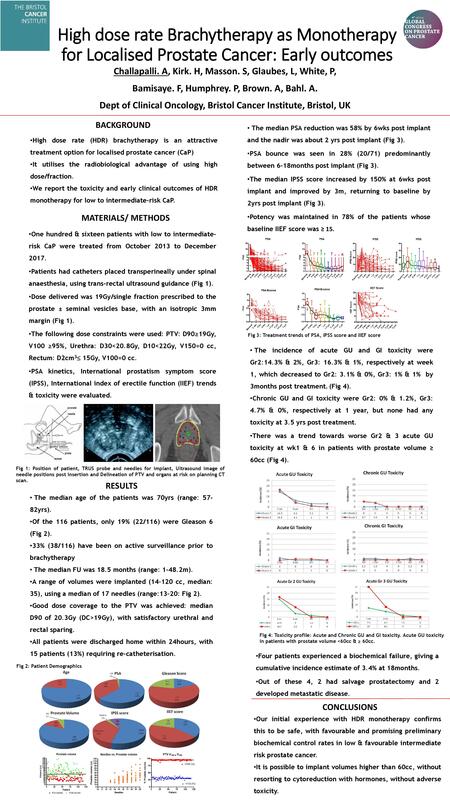 High dose rate (HDR) brachytherapy is an attractive treatment option for localised prostate cancer (CaP) utilising the radiobiological advantage of using high dose/fraction. We report the toxicity and early clinical outcomes of HDR monotherapy for low to favourable intermediate risk CaP. 116 patients with low to favourable intermediate risk CaP were treated from Oct 2013 to Dec 2017. Patients had catheters placed transperineally under spinal anaesthesia, using transrectal ultrasound guidance. The catheters were reconstructed & plan optimised according to pre set dose constraints [DC]. Dose delivered was 19Gy/single fraction prescribed to the prostate ± seminal vesicle base, with an isotropic 3mm margin. PSA kinetics, International prostatism symptom score (IPSS), International index of erectile function (IIEF) trends & toxicity were evaluated. A range of volumes were implanted (14–120, median:35cc), using a median of 17 needles (range:13–20). Satisfactory implants were achieved in patients with volumes ≥60cc, by excluding pubic arch interference on pre-implant MRI pelvis. Good dose coverage to the PTV was achieved: median D90 of 20.3Gy (DC>19Gy), with satisfactory urethral and rectal sparing. All patients were discharged home within 24hours, with 15 patients (13%) requiring re-catheterisation. The median follow-up was 18.5 (range: 1-48.2) months. The median age was 70 (range:57-82) yrs. A 58% reduction in the median PSA was seen by week 6 post treatment (PT), with the nadir seen at 2 yrs PT. PSA bounce was seen in 22% predominantly between 6-18 months PT. The median IPSS score increased by 150% at week6 & normalised by 2 yrs PT. The incidence of acute genitourinary (GU) and gastrointestinal (GI) toxicity were Gr2:14.3% & 2%, Gr3: 16.3% & 1%, respectively at week 1, which decreased to Gr2: 3.1% & 0%, Gr3: 1% & 1% by 3months PT. Chronic GU and GI toxicity were Gr2: 0% & 1.2%, Gr3: 4.7% & 0%, respectively at 1 year, but none had any toxicity at 2.5 yrs PT. Of the 23 patients who had an IIEF score of ≥15 and long term follow-up, 78% retained their potency. Four patients experienced a biochemical failure, giving a cumulative incidence estimate of 3.4% at 18 m.
Our initial experience with HDR monotherapy confirms this to be safe, with favourable and promising preliminary biochemical control rates. It is possible to implant volumes ≥60cc, without resorting to cytoreduction with hormones, without adverse toxicity.